Two Short Films: Ticky Tacky (2014); The Bumblebees (2014). It’s been a while since I’ve watched some short films, but today/tonight I have two short films of particular interest. First, we have Ticky Tacky (2014), starring Oscar Isaacs as a crazy and powerful maniac, and second, The Bumblebees (2014), a stylistic girl gang tale. Both films are available to watch online, so I’ve linked them below should you wish to give them a watch. 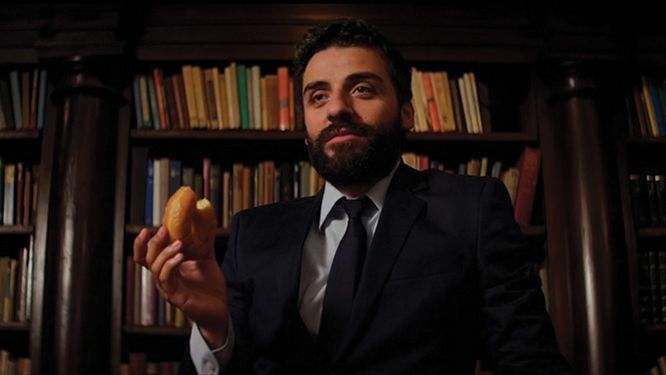 This darkly comedic short is a mere medium through which Oscar Isaac, as an extremely wealthy and seemingly powerful unstable person, is able to channel the wide expanse of his dramatic prowess. Ticky Tacky tells a very short and contained story: When Lucien (Isaacs) is betrayed by those closest to him, he decides to get his deranged, firey revenge. Ticky Tacky is at once absurd, compelling, unpredictable and satisfying; it’s not much more than a couple of people in one room, doing what they do best. The humour is quite strange and dark, but it will work for you if that’s the kind of humour you enjoy. The direction by Brian Petsos ebbs and flows in tandem with Lucien’s state of mind, with steady direction and symmetrical cinematography when he’s in control, and off-kilter everything when he’s lost it. The visuals feel like a blend between Wes Anderson’s nostalgic charm, and Stanley Kubrick’s fastidious shot composition. But it’s Isaacs’ performance that’s the real killer here, with these fifteen minutes providing even more evidence for his marvellous performing ability. Julian Shatkin is also a highlight as Lucien’s child assistant, who seems to have a murderous past of his own. Ticky Tacky is completely well worth a watch. Watch the short film here. Betty Sue (Christina Paterno) seeks to become one of the infamously violent New York girl gang, The Bumblebees, in this short and sweet film. And by ‘sweet’, I mean, don’t call these young women sweet because they will literally murder you to death. A badass portrayal of feminine strength and revenge, The Bumblebees feels like a short story within the context of a larger film. One of the film’s many strengths is its 50s yet modern aesthetic, and its approach to some brutal violence, confronting it head-on in a manner that doesn’t necessarily feel gratuitous. Christina Paterno really sells the role of Betty Sue, with a mix of vulnerability and courage. This is one short film that I’d love to see converted into a feature length film, because it almost wasn’t enough. I’d love to know more about Betty Sue and where she comes from. But as it is, The Bumblebees isn’t a bad way to spent eight minutes, particularly if aesthetics and cinematography is your area of interest. Thanks for the links Anna 🙂 I do love short films just because they’re so focused and contained, so it’s usually very tight and to the point. Could be very dramatic and funny as well. Both sound awesome, and I’m such a fan of Oscar Isaac so I’ll give them a watch right now!! How are you btw 🙂 ? Thanks heaps JW! These were great, I love short films too. Plus Oscar Isaacs is so amazing, I’ll watch him in anything. I’m feeling good! Currently watching The Outsiders so might do a bit of a post on it later on! 🙂 How are you?